Does ab84191 have a his-tag or any other tag? I can confirm ab84191 is not a tagged protein. GFP: ab84191 - what does active mean? Does protein fluoresce the same way (spectra) as if it was expressed in cells/tissue? ab116434 - Does protein fluoresce the same way (spectra) as if it was expressed in cells/tissue? difference between ab84191 and ab116434? Attached is the result of the lab's excitation and emission test. They don’t have an excitation and emission curve, but on their equipment the excitation wavelength was 485nm and emission 535nm. They haven’t verified it’s optimal peak, but there will be variations from one ELISA reader to another and there should be a certain amount of flexibility. 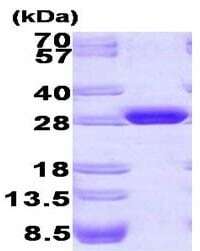 The protein is listed as "active" because we tested excitation and emission. Although we haven’t compared our recombinant protein with cell/tissue expressed GFP, in principle it should fluoresce the same way (spectra). Both GFP protein have two different sources. The protein sequence is the same, but the validation has been done differently. I see this protein is stored in a Tris based buffer. Would the protein still be functional if stored in a PBS based buffer? Also, I need to label the GFP protein via primary amines. Would there be lysines available on GFP to accomplish this labeling? Unfortunately we haven't tested this in PBS and haven’t tried to label the GFP protein via primary amines, so we cannot confirm whether there will be lysines available on GFP to accomplish this labeling. what mass ofGFP protein is being measured in the fluorescence graph, where GFP emmission is measured against uM GFP? The molecular weight of GFP is 27 kDa. A 1.0 uM solution of GFP contains 27 micrograms of GFP per milliliter of solution. In this assay, 200 ul is added to each well, so for the 1 uM standard, the well contains 5.4 ug, and for the 2 uM standard, 10.8 ug, and so on. In regards to the exposure to the laboratory has regrettably not verified the stability of this protein under these mild oxidative conditions, e.g., 0.06% H2O2. Depending on the exposure time the answer would probably vary also. I am sorry therefore to say, that we can not provide a clear answer to this question. In regards to the di'sulifde bonds in hydrogel, indeed the laboratory also thinks that it is possible for disulfide bonds to form with cys 48 (cys 70 is buried within the core of the protein). Perhaps using DTT or other reducing agents can work.